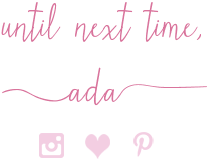 The Blended Blog Asks: May - Hobbies and Fun Things. 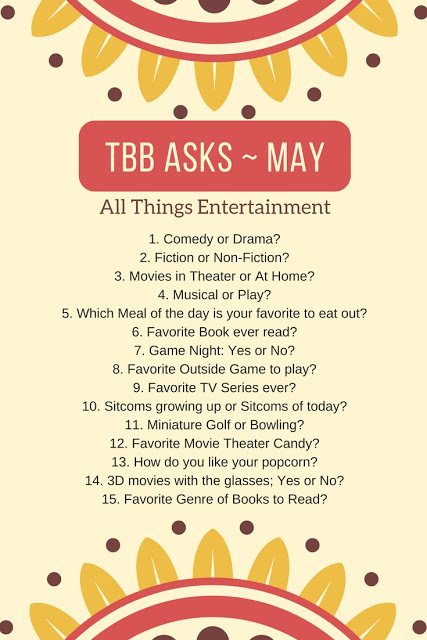 Once again this month I am joing the ladies of "The Blended Blog" for their monthly questionaire: TBB Asks. This month's is all about fun and hobbies such as books, movies and games. Some of my answers may surprise you lol. Happy rest of May everyone! Both. But I tend to watch and like more dramas (as in TV shows) than comedies. Fiction books for sure. I like history and government and such but I prefer to watch those in documentaries rather than read about them. I haven't been to a movie theater in a long while. I probably go to the movies 1-3 times a year. Definitely movies at home, though come to think of it, I haven't watched a movie at home in so long. I have no time. Definitely both, for different reasons. I was involved with music for about a decade since I was like 5 but I also love a good play. As you all know I am artistic and I love to write so I appreciate a great screenplay and some good writing and acting. Most definitely dinner but not on the heavy side. Give me a good fish dish and a yummy salad and I am good to go. This is a difficult question. There has been several. One that comes to mind is "The Kite Runner" by Khaled Hosseini. Not only is this book great but it has some of the most amazing quotes too and I love quotes. It is a best seller and has been translated and sold in over 50 languages. Please read it!! I have never been a game person and I have never done a game night but I hear they are a ton of fun. So I am willing to learn some games and do a game night one day. There will be lots of yummy appetizers and some fun cocktails, too. Hide and seek with my daughter. It is Vivian's favorite. Ever, ever?! It is a 3-way tie between "Dexter", "Wentworth" and "Prison Break". I am not watching many sitcoms these days but I did love "Modern Family" and "Mom". Also I have caught a few episodes of "Young Sheldon" and that was good, too. I hear "Roseanne" the comeback one is great as is "Will and Grace" (I did love the old Will and Grace episodes). I haven't tried the first one and I am awful at bowling but I'd still choose bowling lol. Not a candy person but give me all the popcorn with a ton of melting butter and lots of salt lol. Haha, I just answered that one question above. 14. 3D movies with the glasses; Yes or No? Yes on 3D movies, but it has to be the right movie. Like when I watched "Avatar" which I loved by the way. Thrillers, love stories, mysteries, murder-related books and such. P.S. In case you haven't joined yet, "The Sunday Showcase Linkup" is live and strong on the blog now so please join it with any post, even non-fashion ones. Thanks! !